Today we bring alive a ship that will become one of the "queens" of our Fleet. After commissioning and shakedown operations, she will take her place as the centerpiece of a carrier battle group - the most versatile, mobile, and potent assemblage of conventional combat power ever devised. George Washington will serve our country for 50 years as a roving ambassador and symbol of American technological, industrial, and military strength. 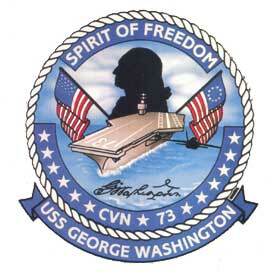 George Washington has been under construction at the hands of skilled Newport News shipbuilders since August 1986. She has been built to exacting specifications, and the Navy has verified through numerous inspections and tests, including underway trials, that the ship meets the contract specifications. She is manned by a crew which was specifically selected for the unique responsibilities and challenges of precommissioning duty. 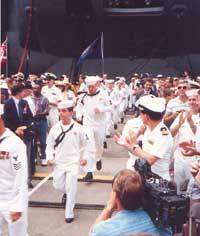 George Washington sailors are smart, hard-working, and enthusiastic. 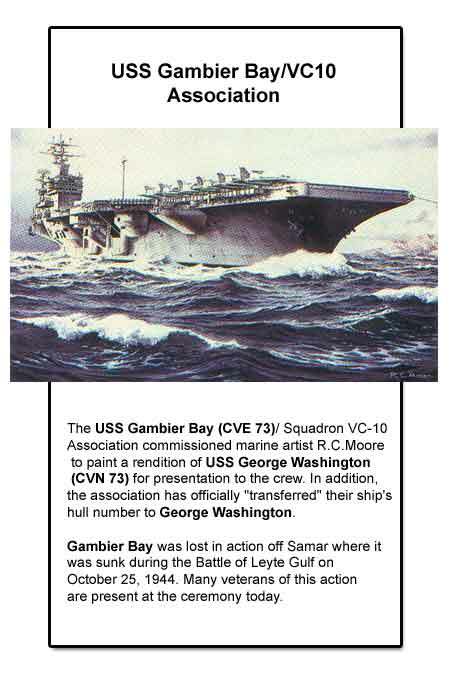 George Washington serves as a model fotthe high- technology, high-quality Navy of the 21st Century. For example, she is the first warship to receive a shipwide computer network which will ultimately enable a "paperless ship" system of interior communications. Also, we are one of the first crews to begin implementing the quality-based leadership and management philosophy known in the Navy's operating forces as Total Quality Leadership. We are proud to be entrusted with a ship bearing the name of the greatest American in history. The qualities that made George Washington great -integrity, courage, perseverance. 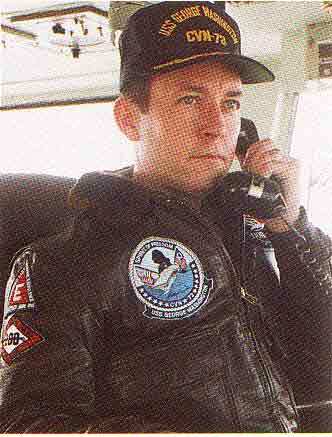 in the face of extreme adversity, and competence in the military arts -are the ideals that will guide and inspire us as we put his namesake into Naval service. Thank you for joining us to celebrate the commissioning of this great ship. for commissioning ceremony to begin. To the left is the USS America. The USS George Washington is on the right. Colors Go aboard the George Washington. The first crew of the George Washington boards.